Usually, when we talking about the tube box,we will think about the tea packaging box,wine packaging box.Yes, that kind of cylinder box is called curling tube box, which semi-automatically made by tube machine after surface printing.But today, I want to introduce another kind of handmade tube gift box,which has no curling edge both lid and bottom. It has the characteristics of luxury looking and rigid stiffness, as the main part of the box body is laminated on tubes. Unlike the round flower box that the whole box is made of craft with grey board in the middle. 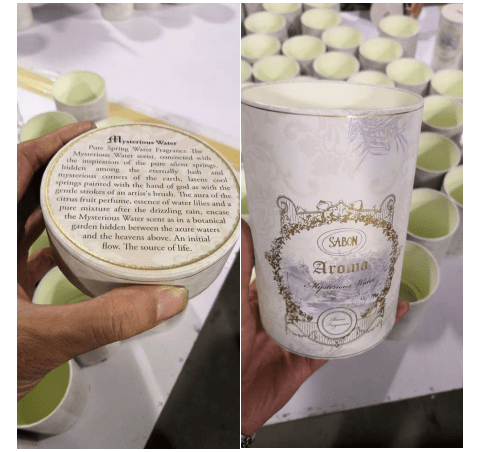 As a tube gift box supplier,our factory has made millions of such paper tube boxes for Sabon, the most famous cosmetic brand in Israel. They all used for perfume packaging with different designs and customized gold foil logo. Also for such kind of round paper box, we make some creative change for handmade part to make the whole box look more elegant and smoothly, which makes them different from those round box made by other suppliers. So you will never disappointed if you choose us to be your paper tube box supplier based on these new skills. You maybe curious where is the difference between our boxes and those boxes made from other factories,right? Here I will tell you some details. Firstly, you will never see any dental part on the surrounding edge of the lid or inside paper. Secondly, you will never see any bubble on the surface of our round box or tube box. Lastly,the paper used on the top of lid and bottom of base as well as inside is no longer the thin paper, so you will never see any paper dental or flaw on our handcraft tube box. If you still interested in such kind of tube gift box for your products packing, you can check and see the video below to know how they been made in our factory.